Our products and systems enable real understanding of information and data, with 3D interactivity giving every project a new dimension. Advanced visualisation, simulation and VR offer an immersive experience, as well as delivering a valuable return on investment. Virtalis will arm you with an essential set of tools to improve your competitiveness. CAD Micro TV learned all about virtual reality at SOLIDWORKS World 2017 in LA. Virtalis provides Visionary Render software that allows users to access and experience a real-time, interactive and immersive Virtual Reality (VR) environment created from huge 3D datasets. Virtalis creates turnkey VR systems that provide seamless CAD integration to help businesses radically improve their design processes. Virtalis’ systems and services reduce design errors, foster understanding and communication, reduce or eliminate physical prototypes and, above all, reduce risk. Better understanding and communication lead to more efficient manufacturing. This is exactly what VR does, as companies like BAE, Leyland Truck and Rolls Royce attest. Operations teams can review virtual prototypes to highlight manufacturing issues earlier, to better understand the human factors implications and to be able to train production line staff to get it right first time. This improves product build quality and reduces errors and levels of rework. It also reduces end-user issues and warranty claims. Virtalis VR has radically improved maintenance procedures and training for maintenance in both industry and in the defence sector, saving time and money and increasing safety. Customers often describe their Virtalis VR system as a communication hub, where barriers are broken down and everyone is able to interact and speak the same language. This is never truer than in this area. VR is an extremely powerful tool for research, helping academics, scientists and students do their jobs more efficiently and effectively, thanks to its power as a communication tool. Virtalis has worked with many of the world’s leading research and academic bodies. Our technology can be harnessed to a wide number of applications within education and research, as our range of case studies demonstrates. Some of the most intriguing are in the sphere of psychological research, as virtual worlds can be created that give reliable repeatability without any variation, enabling the researchers to focus solely of the reactions of their subjects. Virtual training enables risks to students and equipment to be completely eliminated. Add tracking, sound and possibly virtual touch (haptics) too and information becomes assimilated easily through life-like experience. Customers routinely use VR for training their staff. The British Armed Forces use Virtalis’ Helicopter Crew Reality trainer, seen worldwide to be the blue riband of helicopter crew training. Clients repeatedly say that the deep understanding our systems bring is truly transformational to their marketing efforts. The queues at their exhibition booths and the audible “wow” provide clear evidence of this. They have also proved to be invaluable for market research and focus group exercises. Being memorable and being seen as innovative are good for differentiating you in your market and adding value to your reputation and brand. The wow factor is down to the software and the systems we supply. We can work with just about any data from major CAD packages to specialist niche providers. Our developers have created software bridges that maintain the fidelity of your existing data, but render it smoothly in 3D. It is as simple as that once you add the key elements of Virtalis know-how and experience. A real-time immersive scene authoring application (precompile not required) and platform that brings in a mix of data (Multi-CAD, IOT, point-cloud and more) in a quick loading, real-time rendering and realistic 3D visual environment. Its adaptability as a rapid, decision-making platform means that performing detailed design reviews, rehearsing in-depth training tasks, validating maintenance procedures or verifying assembly and manufacturing processes become enterprise wide. You can find them all over the globe and they are as popular with academics as with industry. They are scalable, easily upgradable and our users consider them extremely cost effective to run and virtually future proof. ActiveWall draws on active stereo technology and features a custom screen, specialist computer, Virtalis custom software and powerful projectors. ACTIVEMOVE INTERACTIVE 3D visualisation systems deploy stereo projection technology combined with a transportable screen enclosure. ACTIVEMOVE CVR integrates a Head-Mounted Display (HMD) with VR-ready laptop and peripherals within a rugged case to deliver a turnkey VR solution in a box. In ACTIVEMOVE systems, data can not only be visualised in stereoscopic 3D, but also as fully immersive and interactive virtual environments. This added functionality alters the perspective of the visuals according to the user’s position and orientation within the scene. The hand-held controller, or controllers, allows the immersive experience to be enhanced further – the user can navigate through the virtual world, pick and manipulate component parts in real-time and make decisions on the fly. 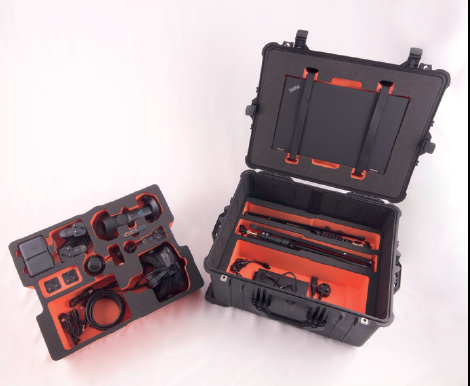 Order Online: Portable Immersive Display Kit (PIDK) – Includes everything needed for Enterprise VR on the go. The ACTIVEWORKS portfolio of immersive display systems are flexible and scalable and can be configured and specified to meet your needs, based on what you want to visualise, the space available and the numbers of users involved. Our in-depth knowledge of many industry sectors, together with our unparalleled visualisation experience and development resources, will allow you to access the most advanced technologies. Virtalis’ world-famous development team has created a portfolio of powerful software designed solely with the 3D environment in mind. 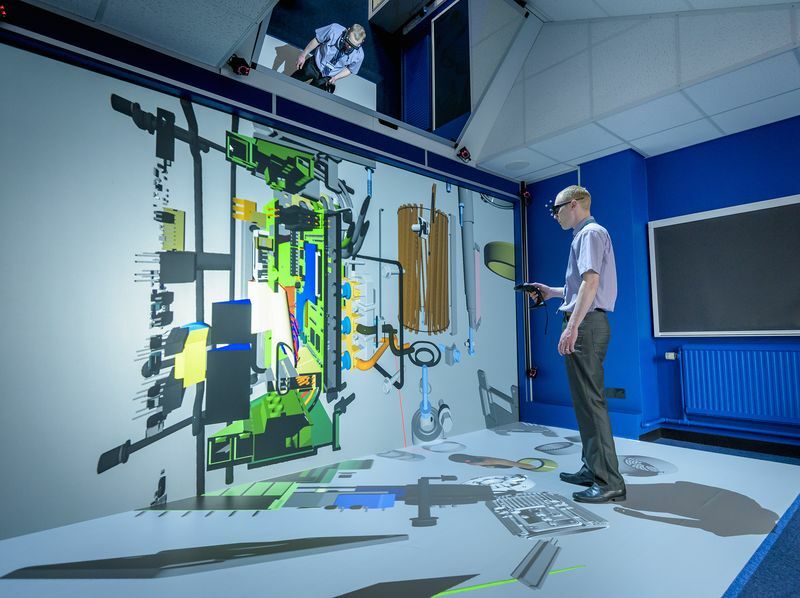 These tools allow users to access and experience a real-time, interactive and immersive VR environment created from their huge 3D digital datasets, ranging from engineering CAD to geodata. With VISIONARY RENDER at its core, we have created GEOVISIONARY with the British Geological Survey, and various modules and add-ons to support specific markets and uses. ACTIVEWALL is Virtalis’ best-selling interactive 3D visualisation system, providing a scalable immersive and interactive installed VR environment. You can explore information and data and stimulate intra and inter-disciplinary communications, facilitating a level of understanding often unattainable using conventional methods. The improved understanding our systems bring will transform your design reviews, manufacturing processes, training programmes and marketing efforts. Systems can be single or blended multi-channel, with optional head and hand movement tracking. An ACTIVEWALL can be linked to other ACTIVEWORKS systems so that remotely located participants can interact together simultaneously in the virtual scene. ACTIVECUBE is considered by many to be the ultimate interactive 3D visualisation system. It achieves a high level of immersion thanks to the stereoscopic images fired at multiple screens surrounding the user. Believability is further reinforced by the integral tracking, which allows entirely natural, real-time interaction with objects in the virtual world. ACTIVESPACE is a head-mounted display (HMD) interactive 3D visualisation system that provides commercial and academic users the ultimate immersive 360° experience for an affordable price using professional or consumer HMDs. You have the flexibility and freedom to move around in your virtual environment, totally unrestricted. Many people who would like to bring the power of 3D into their organisations are constrained by the space available for a VR system. ACTIVESPACE is the perfect solution, enabling you to benefit from all the power of fully tracked Virtual Reality in a tiny area. ACTIVEDESK provides a wholly immersive and interactive virtual environment in which to better explore and understand information and data at and around your desk. Immersive environments stimulate multi-disciplinary communications, facilitating a level of understanding for you and others before linking up in a larger display system. Huge advances in 3D desktop visualisation tools mean Virtalis has been able to draw on this technology and integrate them to create ACTIVEDESK. We have developed drivers that bring Visionary Render models onto the zSpace and into a range of head-mounted displays for commercial and academic users. ACTIVEMOVE is a transportable, interactive 3D visualisation system that is setting the industry benchmark for both price and performance. ACTIVEMOVE is transported in two, custom, wheeled cases specifically designed for local and international shipping, making it easy to share between locations. It is ideal for delivering and supporting marketing events and training workshops.